Cromwell Military Swords for sale measure 43 ½ inches overall. They have a 32 ¾ inch, forged high-carbon steel blade. These swords have a wire wrapped sharkskin handle and a blackened guard decorated in a gold foliage pattern. They are accurate replicas of the original mortuary hilt style sword that was carried by Oliver Cromwell at the 1649 Battle of Drogheda. 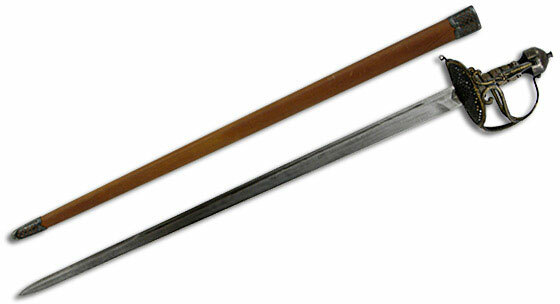 A brown leather scabbard is included with these pieces, though the original Cromwell Sword lacks one. The historically accurate, highly detailed Cromwell Military Swords typically feature the following specifications: Handle length of 6 inches, point of balance is 3 ½ inches, width at guard 1.35 inches, width at tip .77 inches, thickness at guard .23 inches, thickness at tip . 13 inches, point of harmonics is 21 inches, weight approximately 3lb 4oz. Buy the Cromwell English Military Swords which combine historical authentic detail with modern construction for $329.99.